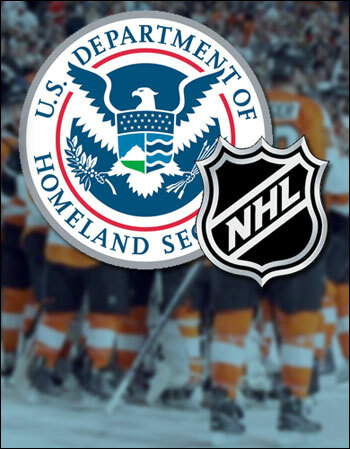 On Thursday, Department of Homeland Security boss Janet Napolitano took to her government blog to announce a new partnership with the National Hockey League. Napolitano promised that fans at Citizens Bank Park in Philadelphia will be subjected to “see something, say something” government snitch propaganda during a game between the Philadelphia Flyers and the New York Rangers. As part of the Department’s “If You See Something, Say Something™” partnership with the NHL, a Public Service Announcement will be read before and during games, and campaign graphics will appear on the videoboard and on ribbon boards. Safety messaging will also be printed on the back of NHL Winter Classic credentials for staff, players, and volunteers. In addition, the Department has partnered with the Commonwealth of Pennsylvania and City of Philadelphia to place “If You See Something, Say Something™” advertisements throughout Philadelphia at airports and gas stations, and on buses, trains and billboards. “Our message is simple: if you see something that doesn’t look right – an unattended bag or package, a person behaving in a suspicious manner, a vehicle that seems out of place – report it to the authorities. This partnership is another example of how DHS and our nation’s sports leagues are working together to protect our country,” Napolitano writes. Since there is virtually no terrorism in the United States – and the only would-be terrorists about are mostly brain-dead patsies instigated by the FBI – Napolitano and the bloated DHS bureaucracy are now rolling in the element of domestic crime. “Hometown security is the key to homeland security. Time and again, we have seen the value of public vigilance in thwarting terrorism and crime,” she writes. The DHS and its partners – a blizzard of funding hungry federal bureaucracies, local cops on the federal largess take, and now the corporate sports industry – have a vested interest in spreading around needless paranoia and growing a dumbed-down snitch culture.